CWA Local 6355 President Bradley Harmon sent us this dispatch from Missouri. 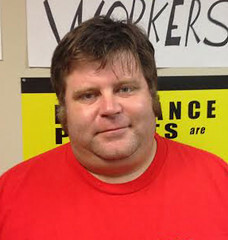 CWA Local 6355 President Bradley Harmon. CWA is part of the St. Louis community which includes the suburb Ferguson. Ever since Police Officer Darren Wilson shot and killed unarmed black teenager Michael Brown on Aug. 9, CWAers, like the rest of the St. Louis community, have found themselves in a whirlwind. St. Louis is one of the most segregated cities in the U.S. We used to be a great industrial center and Ferguson used to be a middle-class community where nearly everyone could find a good job. But Ferguson was among the hardest hit communities by the foreclosure crisis. Good union jobs in manufacturing and the service industry have been moving overseas for decades. Public services have been slashed. The school district that serves part of Ferguson has been taken over by the state and is in the process of being privatized. The social services office where CWA Local 6355 members work near Ferguson has seen staffing levels drastically reduced. The state university in St. Louis County has increased tuition and fees by nearly 300 percent since the Great Recession began. Today, 47 percent of young black men in St. Louis can't find employment. CWA activists with community allies demonstrate and sit in at the Wainwright Building in downtown St. Louis calling on Gov. 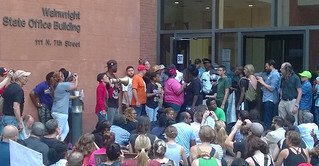 Jay Nixon to intervene and demilitarize the police response to demonstrations in Ferguson. The Wainwright is home to CWA represented Missouri Department of Social Services employees and Nixon's St. Louis office. But CWA and other unions have been doing serious organizing in St. Louis for several years. That organizing is part of the reason why a peaceful and positive resistance has coalesced around the community grief and outrage at Michael Brown's death. CWA Local 6355 has been working closely with a St. Louis civil rights group, the Organization for Black Struggle, to fight back against cuts to the Missouri Department of Social Services. CWA members from every local in Missouri have participated in support actions with fast food workers who belong to Show Me $15 in the fight for better wages and a union at fast food restaurants. Many of the leaders of the peaceful resistance movement in Ferguson have developed organizing skills from the battles CWA members have fought. The fight for justice for Michael Brown in Ferguson is being led by the people of that community – as it should be. But CWA members are part of that community and, with our allies, are playing a major role for positive change. CWAers have been in the streets with the people of Ferguson demanding justice. CWA activists are supporting protest actions and voter registration drives and exploring how the labor movement can better engage in the fight for racial equality. Community alliances aren't always easy. Racial inequality is an uncomfortable subject for many union members to address. But building a movement for democracy and justice demands that we find common ground and that we take our commitment to "be there" in allied organizations' fights for justice seriously.